Thumbtack Reviews - Hire Best Local Professionals? 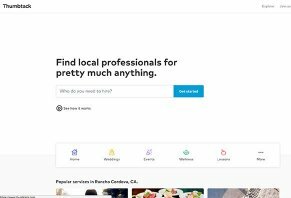 Whether it’s home improvement, weddings, events, wellness, lessons, crafts, design and web, or pretty much anything else, when finding local professionals, Thumbtack is a completely free app that does all the work for you. The website indicates they have professional listings for every county in the United States, each of which will have a profile where you can read reviews and chat directly with them. And based on their data accumulated from millions of professional bids, you’ll also gain access to free price estimates, including what other people have paid for projects like yours. All of this takes place directly in the app, without any cold calling or mystery pricing involved. Several popular professional websites are competing for many of the same clients as Thumbtack, many of which are also free. Is there anything about them that stands out and makes them more worthy of your time? Let’s explore all of your important questions, starting with how you’ll use the app. How Does the Thumbtack App Work? After downloading Thumbtack’s iOS or Android app, you’ll start by entering the services you need, inputting your zip code, and tapping the Get Started button. From there, you’ll sign up by entering your email address (or your Facebook or Google credentials), choosing a password, and then entering your first and last name. Next, you’ll choose which service you need, either by category (home and garden, wedding and events, lessons, etc. ), via the Recommended for You section (based on your previous inquiries, if applicable), or using the search bar at the top of the page where you can manually enter relevant keywords. We chose ‘roofing replacement,’ after which Thumbtack asked a few questions to help ensure they pointed us in the right direction. In our instance, this included indicating if the work involved a partial or full replacement, and if it involved installation on an existing home or new construction. We then indicated what was wrong with the roof (e.g., past its lifespan, leaking, cracked or damaged, remodeling, etc. ), the number of stories for the property, roof steepness and age, approximate square footage, and which material we wanted the new roof to be. Thumbtack's iOS and Android apps walk you through finding the right professional, using a straightforward, step-by-step questionnaire. From there, you’ll gain quick access to free estimates. Is the project covered by an insurance claim? And if so, has it already been approved? What’s the property type (residential or commercial)? Do you have photos to add or notes regarding anything else you feel the professional should know? After entering a zip code, we were taken to the Prospects page of Thumbtack’s app, where inquiries started coming in seconds after we completed the questionnaire. After clicking on the project, we could see the number of reviews for each relevant contractor, their average star rating, number of years in business, and the number of times they’ve been hired via the app. Important: The company’s Safety Tips indicates these profiles “are designed to give you helpful information to hire the right pro." You'll want to pay close attention to customer feedback and focus on licensed contractors, as well as those who have built a reputation for quality and passed a basic background check. If you’re interested in a specific contractor and they pass your initial scrutiny, you can tap the ‘Request a Quote’ button, which will put you in touch. Much of the same can be accomplished directly on Thumbtack’s website, although not necessarily in the same order. Combined, Thumbtack advertises they track cost estimates for 30,000 projects a day, and their 250,000+ registered service professionals send millions of combined quotes every year. Thinking about signing up as a professional? Let’s briefly take a look at how this works. After answering specific questions related to their project or service needs, Thumbtack's Instant Match service will automatically (where available) generate an estimate for each prospective customer based on prices you pre-set, along with your availability and other preferences. The tailored estimate customers receive will also include your profile, where they can learn how to reach out if they’re interested in learning more. Every week, Thumbtack sends a detailed report outlining how you compare to other professionals on the platform, as well as methods you can implement to improve your results, if necessary. How Much Does Thumbtack Cost? Thumbtack’s services are completely free for customers. More than 1,000 of them are backed by the company’s $1M Property Protection Guarantee (stipulations apply, so make sure you read through all the details on their website). Professionals are only charged when prospective customers reach out after receiving a bid. You can set a weekly spending limit and see how many times you can afford to be contacted. Whether as a customer or professional, if you have additional questions, service can be emailed at support@thumbtack.com. What Can We Learn From Thumbtack Customer Reviews? With 1,800+ combined customer reviews between iTunes and Google Play, the Thumbtack app had an average rating of about four stars at the time of our research. Common compliments referenced ease of use (quickly receiving estimates, no spam/telemarketing calls, etc. ), along with quality professionals. On the other hand, complaints often revolved around no results, functionality concerns, and less-than-stellar contractors. From a company perspective, Thumbtack was co-founded in 2008 by CEO Marco Zappacosta, Executive Chairman Jonathan Swanson, and Sander Daniels, and is based out of San Francisco, CA. They held an A+ rating with the Better Business Bureau, based on 196 customer reviews (165 of which were negative) and nearly 350 closed complaints, as of 5/21/18. Most of these seemed to be professionals expressing their dissatisfaction with Thumbtack’s leads, their price changes, and a general lack of customer support. A company representative responded to and resolved each complaint. Are There Other Companies Like Thumbtack? When it comes to finding online professionals, there are a wide variety of sites competing for the same prospects as Thumbtack, especially if you’re in the market for home improvement-related services. Like the company in question, all were completely free for customers, provided access to thousands of vetted professionals (at various levels, depending on the provider), listed additional helpful resources (project guides, cost data, etc. ), offered robust guarantees, and came with similarly positive customer feedback and overall average ratings. Porch.com Home improvement professionals: handyman, landscaping, new homeowner-related tasks, etc. This is to say nothing of alternatives (depending on your specific needs) like Upwork (writing, design, web and mobile development, admin support), Fiverr (graphics and design, music and audio, programming and tech), Gigmaster (entertainers, photographers, party rentals, etc. ), and so forth. Considering that the majority of these are free to customers until hiring a professional, how can you choose which is the right option for you? With such robust competition, it might largely come down to which site offers access to the highest number of professionals related to the specific service you need. What kind of budget are you working with? Which might determine whether you’ll benefit from a ‘bare-bones’ site like Fiverr, or from a full-price professional on sites like Thumbtack (as but a couple of examples). Which companies have been around the longest? Although, this isn’t necessarily an indication of the contractor’s quality. Do they offer secondary services? If you’re in the market for additional consumer goods or home improvement loans, Handy.com and HomeAdvisor, respectively, might be more up your alley (again, as just a couple of examples). How does all of this relate to Thumbtack? Bottom line: It’s difficult to beat free. And when it comes to Thumbtack, this not only relates to finding local contractors and quickly learning detailed information about them, but also extends to obtaining estimates. And while ‘time is money,’ as the saying goes, based on our brief experience using the app, customers can accomplish this within a matter of minutes. Add to this that they’ve been in business since 2008 and come with a mostly positive online customer reputation, and it might be well worth your time to give Thumbtack a try. We had some plumbing, yard work, repair cabinet and other work that needed to be done. We went to Thumbtack and hired AJW Property Services. AJ was on time, quoted his price and stayed with it. He went to the hardware store to get the materials he needed. Pleasant and stayed in touch at all times. If you need work done I would tell you to contact AJ. Write a Review for Thumbtack!